The Collected Issues of Point Lookout is a collection of past issues of Point Lookout, my weekly email newsletter of tips, insights and perspectives that help people in dynamic problem-solving organizations find better ways to work with each other. The articles are from 2001 and 2012. The book gives concrete, nuts-and-bolts methods for dealing with real-life situations. The Collected Issues of Point Lookout is a collection of short articles that give tips, insights and new perspectives on life in the modern workplace. It's drawn from the 2001 through 2012 issues of my newsletter, Point Lookout , and it's filled with the insights you need to make sense of it all. It helps you avoid the traps and pitfalls that await you at work, and it guides you into new choices that can make life at work more enjoyable and rewarding. 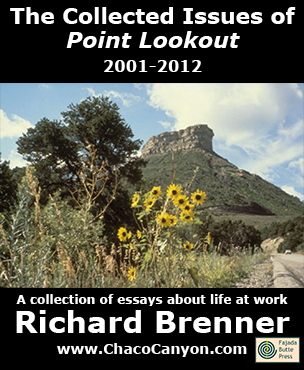 The Collected Issues of Point Lookout makes a wonderful and unique gift for a friend, a colleague, or a spouse who faces any of the ordinary — and many of the not-so-ordinary — challenges of working today. It includes all I wish I had purchased this when I started working. If so, it would have saved me a lot of heartburn and helped me to propel my career into higher orbit. It increases your sensitivity, your capacity to see and understand the politics and work life. Buy it, read it, and re-read it. Thanks Rick for bringing out such wisdom. — G.S. Raoof the content of Geese Don't Land on Twigs , Why Dogs Wag , Loopy Things We Do , Things We Believe That Maybe Aren't So True , and The Questions Not Asked , but it's more valuable than buying all five for three reasons. First, it contains the articles from 2011 and 2012, which none of the others do. Second, it's completely searchable, so when you search this file, you're searching all five plus the extra years, too. Third, and more important, many articles contain hyperlinks to other articles, and some of those links cross the boundaries of Geese, Dogs, Loopy, Things, and Questions, and 2011-12. So it's one seamless resource that provides endless hours of insight and fresh perspectives. Collected Issues is in Acrobat format, which gives you several advantages. You can print it, and read it like any book. Or in electronic form, you can use the search capability of Adobe Reader to find passages of special interest to you. If you load it onto your laptop, tablet, or other mobile device, you can read it anywhere — and it's weightless, too. 1263 pages.